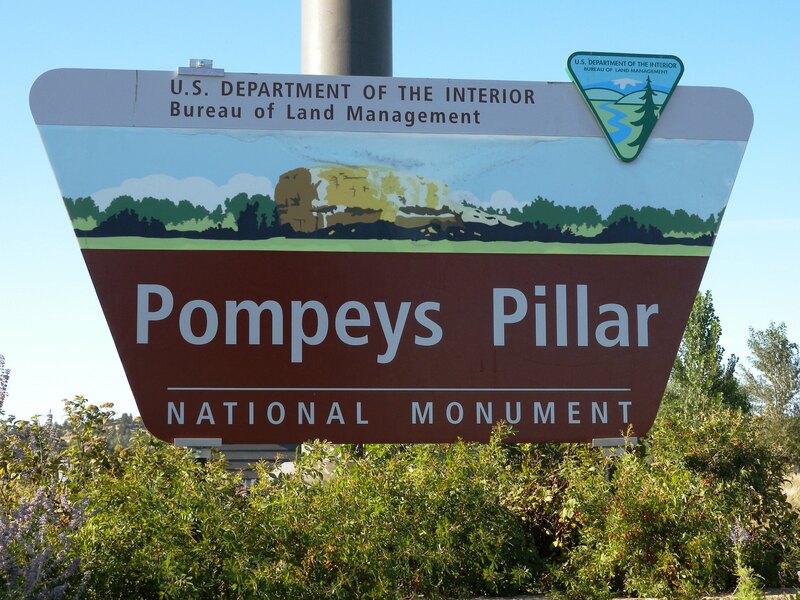 I missed Pompeys Pillar too, another integral part of the Lewis & Clark story, arriving nine minutes after the gates were locked. But Pomp’s is a story I’ll share with you anyway. 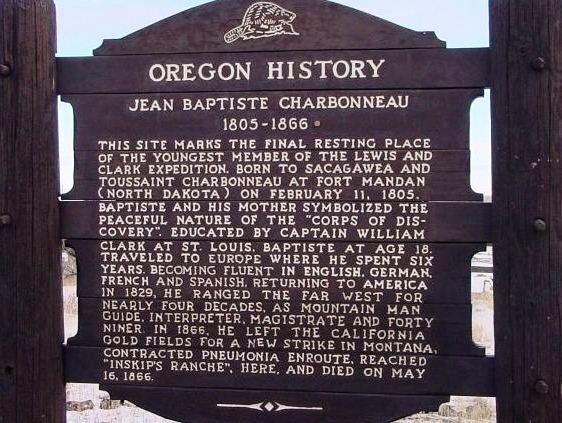 Jean Baptiste Charbonneau was born February 11, 1805; the son of Sacajawea and Toussaint Charbonneau; she was Shoshone, he was French Canadian. 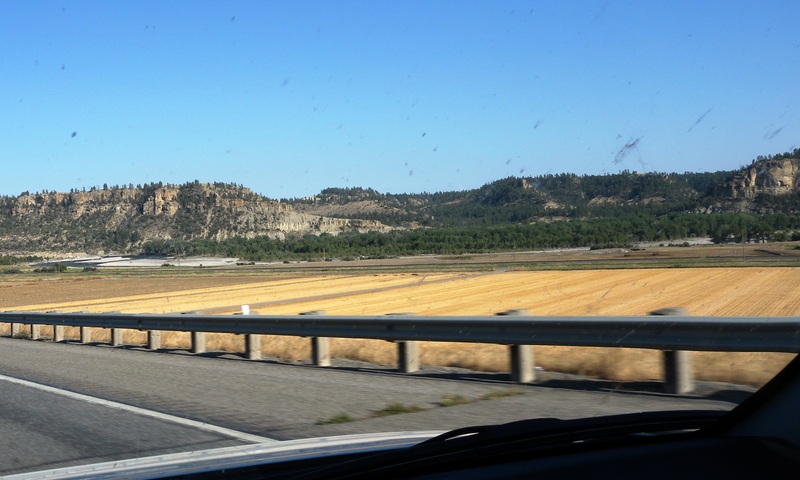 You know the story; Lewis and Clark had invited them to join their expedition westward as an interpreter team. While they were wintering at Fort Mandan, Lewis recorded the baby’s birth as follows “About five Oclock this evening… the wive of Charbonneau was delivered of a fine boy…this was the first child this woman had boarn, …her labour was tedious and the pain violent.” Lewis counseled with others and then administered a small mixture of water and the crushed rings of a rattlesnake to help induce birth. His journal indicates she delivered shortly after. On April 7, 1805, riding in a river boat with his mother, the 55-day-old Jean Baptiste joined the expedition as the Corps left Fort Mandan to continue their journey toward the Rocky Mountains and Sacajawea’s people. A baby, on a mission for the President! Jean Baptiste was a healthy and active boy and a great favorite of Clark, who nicknamed him “Pomp and Pompy,” for his pompous “little dancing boy” antics. The Charbonneau family was on the return trip too; as Clark explored the Yellowstone River they came upon an unusual, free-standing sandstone formation on the south shore. Clark named it “Pompy’s Tower” after the year-and-a-half-old Jean Baptiste. He etched his own name and the date July 25, 1806; it was his birthday. Clark also named a nearby stream “Baptiests Creek” in honor of the boy. When they got back to the Mandan villages Clark offered to raise the child as his own son, as soon as he was weaned. He later wrote a letter “As to your little Son (my boy Pomp) you well know my fondness for him…if you will bring your son Baptiest to me I will educate him and treat him as my own child….Charbono, if you…will come to me, I will give you a piece of land and furnish you with horses, cows, & hogs…Wishing you and your family great suckcess & with anxious expectations of seeing my little dancing boy Baptiest I shall remain your friend.” In 1809 the family came to St Louis and received their land warrant but Toussaint did not like tilling the soil. In 1811 he transferred his land title to Clark and left Jean Baptiste in his charge, to begin his education. The rest of the story is as unbelievable as the first part: Baptiste completed his schooling in St Louis and returned to the frontier; at age 18 he met Prince Wilhelm of Germany, who was intrigued by Baptiste’s unusual combination of frontier skills and cultural accomplishments. Prince Wilhelm invited him to Europe, where Baptiste lived the royal lifestyle for the next six years, becoming fluent in four languages. He returned to America in 1829, set aside his sophisticated manners, and fell into life as a mountain man, hunting, trapping and exploring the American west. He scouted for the Mormon Battalion in 1846-47; after his discharge he was appointed Alcalde of San Luis Rey Mission in California, an office comparable to a magistrate. Troubled by the abuse of landowners toward certain Indians, he resigned his official duties and joined the California gold rush. 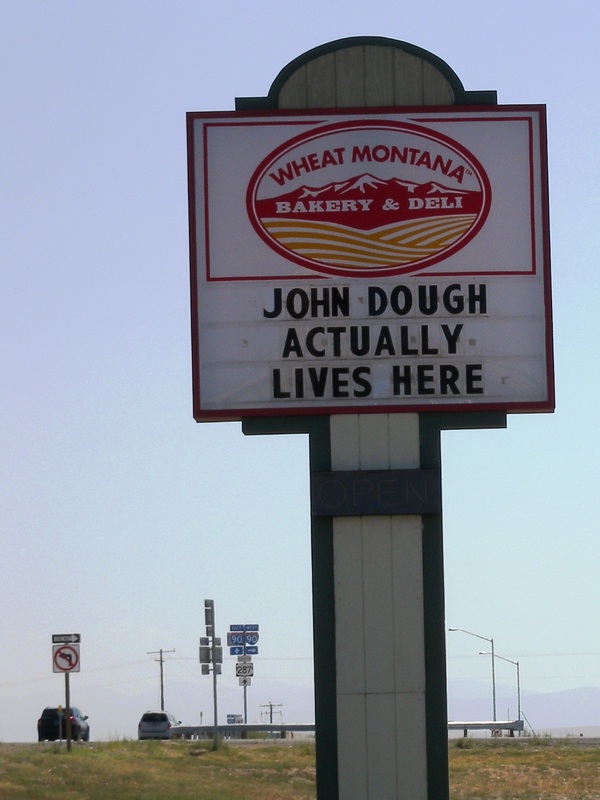 He did not strike it rich there and in 1866 headed for new gold discoveries in Montana, but died of pneumonia along the way. 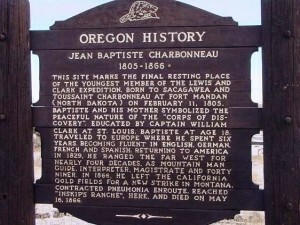 He is buried in a remote cemetery near Danner, Oregon; his gravesite is on the National Register of Historic Places. Pompeys Pillar National Monument is more often visited than his gravesite; it is one of the most famous sandstone buttes in America. Although William Clark originally named it Pompeys Tower, Nicholas Biddle, who first edited the Lewis and Clark journals, changed the name to Pompeys Pillar. In November 1991 this historic landmark was purchased from private ownership; in 2001 it was designated a National Monument. 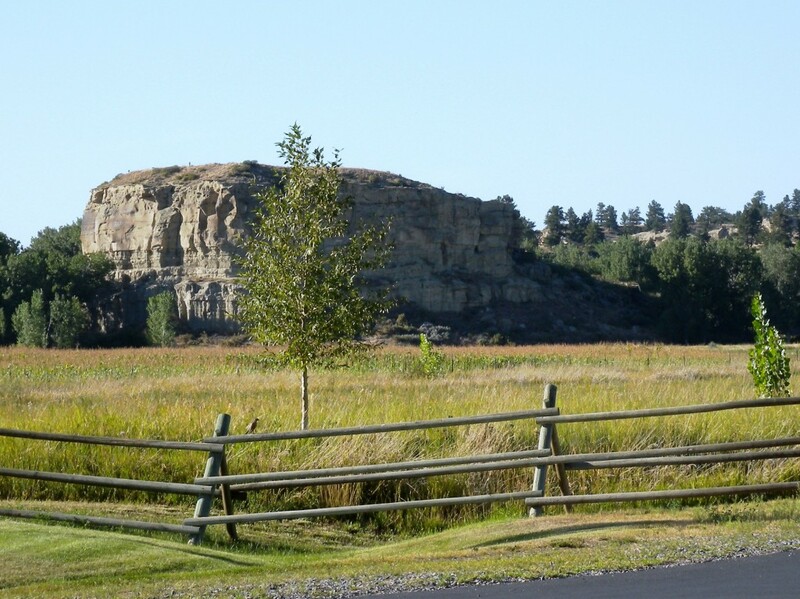 Just 25 miles east of Billings, the Monument is easily accessible from I-94, and during summer months visitors can walk the boardwalk to see Capt Clark’s signature; trails lead past replicas of the expedition’s canoes to the top of the 150-foot-high Pillar for a view of the 670-mile-long Yellowstone River. 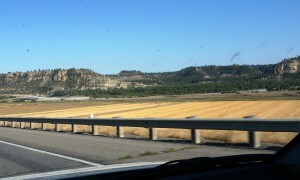 I made it to destination Forsyth just before dark, the sun still glowing on the sandstone cliffs behind my motel. 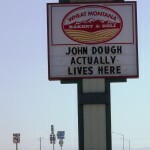 The Montana wheat fields and rivers are part of my history now, even if I didn’t stop.